Posted on Fri, Feb 10, 2012 : 11:40 a.m.
Washtenaw County will pay the Humane Society of Huron Valley $415,000 to continue providing animal control services this year under the terms of a tentative agreement announced Friday. The agreement, which must still be approved by the county Board of Commissioners and the Humane Society, also establishes a process for determining the actual cost of providing animal control services. The Humane Society of Huron Valley will continue providing animal control services under a proposed agreement. 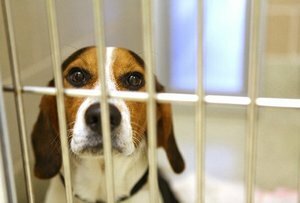 The agreement appears to end a months-long dispute between the county and the Humane Society over a fair price for animal control services. The county said it would reduce its fund balance or rainy day fund to cover the cost, which is $165,000 more than the county included for animal control in its 2012 budget. “I’m relieved that we were able to reach an agreement with HSHV that both honors their mission and recognizes our long-term budget constraints,” said Conan Smith, chairman of the Washtenaw County Board of Commissioners in a press release, issued on Humane Society of Huron Valley letterhead stationery. Last fall, county and HSHV officials argued over the appropriate budget for animal control-related services, and the county ultimately reduced the annual allocation for HSHV from $500,000 to $250,000. HSHV officials responded that they would not be able to continue services for the county at that level. The county subsequently authorized a short-term appropriation to allow the organizations’ leadership to investigate alternatives. As part of the new agreement the county and Humane Society will participate in a process led by Sheriff Jerry Clayton to develop a cost model for an “animal service unit.” The process will use Humane Society data to help determine that cost, the press release said. The goal will be to develop a “mutually acceptable basis for estimating costs beyond 2012,” the press release said. County and Humane Society obligations will be considered in the process. The county is also considering creating an Animal Services Steering Committee to oversee the process and make a final recommendation on costs and budget to the Board of Commissioners, the release said. The committee would include members of the commission and representatives of the county sheriff’s, prosecutor and treasurer’s offices, which each have statutory obligations for animal welfare. Sat, Feb 11, 2012 : 9:03 p.m. Sat, Feb 11, 2012 : 6:26 p.m.
Fri, Feb 10, 2012 : 11:40 p.m.
@Leah Gunn: According to Commissioner Ronnie Peterson, with whom I discussed the issue earlier this week, there is ZERO guarantee that the WISD will win the NATIONAL COMPETITION for new Head Start funds to relaunch the program under the WISD. By giving up its preferred position for a routine renewal of the contract the County Commissioners have jeopardized the entire program and the county may not have a Head Start program at the beginning of the next school year. Also, the County Commissioners voted to terminate the program before ANY agreement had been made with the WISD that they would ever apply for the funds. Perhaps Commissioner Gunn should get her facts straight before launching incorrect &quot;ad hominem&quot; attacks when some citizen brings a valid complaint to the Commission and to the public's attention! Sat, Feb 11, 2012 : 6:24 a.m.
@Johnnya2: I support the humane society and they do wonderful work. You'll notice the article is tagged at the bottom &quot;Washtenaw County Budget&quot;. At the same budget meeting that a majority of the Commissioners voted to defund the humane society, they defunded the Head Start program. While the Commission may now correct the error they made with respect to defenseless animals, they are not taking steps to correct the error they made with respect to defenseless young children. By taking these actions they are gambling with the lives of 500 disadvantaged children and their dedicated teachers. I think it's a scandal what they have done and that's why I am speaking up about it! Sat, Feb 11, 2012 : 5:36 a.m.
Fri, Feb 10, 2012 : 10:11 p.m.
Stop paying the commissioners if the county is broke. As usual, Mr. Ranzini has his facts wrong. The County is transitioning its Head Start program, which was underwritten by county general funds by about a half million dollars a year. This was due to the fact that the Ypsilanti and Lincoln Public Schools would not pay the requied matching for the program. (The Ann Arbor, Whitmore Lake and Willow Run school districts do pay.) The regional federal office will interview applicants who respond to the RFP, and, at this time, it is likely that the Washtenaw Intermediate School District will run the program. There is no interruption in services, and no children are being &quot;left in the dust&quot;. The programs continues, but just with a different governance. Sat, Feb 11, 2012 : 6:06 a.m.
Fri, Feb 10, 2012 : 9:53 p.m.
From one dog to another, man it's getting rough out there. Fri, Feb 10, 2012 : 9:14 p.m. It is important for citizens to understand that the county payment to HVHS will reflect the seventeen percent cut that was made in our general fund budget for the year 2012. Shared financial sacrifice within the county organization and with the sevice providers with whom we contract with general funds is what has allowed the Board of Commissioners to create a viable budget. I am proud that our hard work has created a means for the county to protect vulnerable citizens to the greatest extent possible. As the community must understand, reaching this agreement with HSHV has required compromise by all concerned, quite including myself. Name calling and global accusations do no support mutual goals. Hard work lies ahead as all involved plan future animal services. Thu, Feb 16, 2012 : 1:35 a.m. But why did it take you so long? You have a long ways to go to properly fund the humane society for the animal control function it does for the county . You would have been in a world of hurt if they walked away. Luckily they have the best interest of the animals in mind. You on the other hand have your best interest in mind. Fri, Feb 10, 2012 : 9:06 p.m.
Yeah, we keep hearing that the County is looking for more cuts, but I have also heard from county employees that after all of the union employees agreed to take paycuts and contribute more towards benefits, that now the County is giving 4% raises to the non-union employees. And I haven't heard, did those four administrators ever get their $15,000. raises? It appears to me that they talk cuts out one side of their mouth, and give money out the other!!!! Fri, Feb 10, 2012 : 8:57 p.m.
&quot;Animal Steering Committee&quot;? By all means, let's throw a few more stumbling blocks in the path of what is arguably the best-run community service entity in the County. Leah, no one is arguing the need for cutbacks (unless it's your guy the Mayor and spending millions on art, lol). Everyone needs to look for cost savings. But Board Chair Conan Smith was arrogant and insulting during this process and that was totally uncalled for, and it made the process more difficult and stressful than it needed to be. Fri, Feb 10, 2012 : 8:18 p.m.
Great news after Conan Smith and his arrogance and insult of this great organization almost blew this deal. Fri, Feb 10, 2012 : 7:12 p.m.
A great day for animals in Washtenaw County! Sat, Feb 11, 2012 : 5:38 p.m.
3 barks for the county....err cheers. Fri, Feb 10, 2012 : 6:44 p.m. The skate park is being built with County Parks millage funds, which are entirely separate from the county general fund. This millage was passed by the voters and renewed three times. These funds are not controlled by the Board of Commissioners. Lost in the discussion about animal services is the fact that the county donated one million dollars to the HSHV to assist them in building their new shelter, so there is no lack of generosity on the part of the county. Those foreclosures that are mentioned have resulted in a loss of revenue from property taxes, which support county services, so naturally Ms. McDaniel, at the direction of the Board of Commissioners, is looking for savings in all parts of the budget. Thu, Feb 16, 2012 : 1:31 a.m.
Oh Ms. Gunn, when will you drop the whole million dollar discussion? It just shows your ignorance when it comes to funding mandated services. All these years the county, one of only in the area has not needed to build their own building and hire staff to do animal control. The million dollars WE donated to the Humane Society was the least our county could do to support this service that we have never needed to fund. If the county had to handle animal control like Jackson, Livingston, Wayne and nearly every other county in the state, it would be a ton more. You should be finding ways to fund more of these services and less time talking about how generous the county (ie: You) have been. Fri, Feb 10, 2012 : 6:12 p.m. Excellent news... and well deserved by the HSHV which is one of the best of its kind in the country. Fri, Feb 10, 2012 : 5:16 p.m. While this is a consolation on the county's part when will we hear about the reimbursement of money by commissioner and administration that were paid for expenses that did not qualify for reimbursement? Why is Verna McDanial still looking for budget cuts yet a skate park is being built with county matching funds that total about 400,000 dollars of taxpayer money while human services are cut? Having personally witnessed the community impact of the housing foreclosure and the number of animals that get dumped is tragic. HVHS is an outstanding organization with incredible compassion for the animals they shelter. In the frothy plus years I have lived in Ann Arbor they have always, always been there for our community. While bureaucrats will come and go, the needs of the shelter, it's vets and staff will never waiver from their mission. All their funding should be restored because for every dollar spent it improves Washtenaw County tenfold. Fri, Feb 10, 2012 : 5:12 p.m. This is great news. The Humane Society of Huron Valley is a great partnership between government and a private entity that saves taxpayers money. I'd hate to have stray dogs running loose or needing help, or have an inefficient government pay for it all.